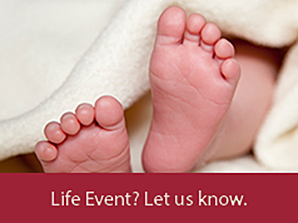 Throughout the calendar year, you may experience a “Life Event” that affects your benefits, such as marriage, divorce, birth or adoption of a child, a change to your spouse’s employment or insurance coverage, or a change in coverage for a dependent child. You have 30 days from the date of a Life Event to make a change to your benefits, by submitting a Change Benefit request in Workday. The effective date of your benefit change is the date of the actual Life Event (i.e. date of marriage or birth date of child). Click on the Benefits Worklet from the home screen. If you are enrolling any new Dependents, click on the Dependents button under ‘Change’ then click the Add button. (If you are not adding dependents, please proceed to the next bullet point) You will need to enter the name that appears on their Social Security Card, their relation to you, date of birth, gender, Social Security or Tax ID number, and address, then click Submit. If you do not have their Social Security or Tax ID number, you can leave it blank but you will be required to provide a reason for the blank field on a later screen. Repeat this process until all Dependents have been entered. After clicking on the Benefits worklet, Click on Benefits under “Change”, then choose the applicable Event type (options are Add/Change Beneficiary, Birth/Adoption, Death of Dependent, Divorce, Gain of Coverage, HSA Contribution Change, Loss of Coverage, and Marriage). Enter the Life Event date in the field provided. Click Submit to proceed. You will be required to make an election for every benefit that is not grayed out on the next several screens. Choose the coverage level for each benefit type by clicking the blank field provided and selecting the prompt (three horizontal lines). If you choose any coverage level other than Employee Only, you will need to also select the Dependents that you would like to cover for each benefit. Click in the box to the left of the Coverage column and click on the prompt. Choose Existing Dependents if you added them in an earlier step (Note: If you missed the earlier step, you can click Add New to enter your Dependents information now) and click on the bullet next to each dependent you would like to cover. If you are not interested in the benefit, choose the Waive bullet to the left of the benefit type. Click Next at the bottom of each page until you get to the Submit button. Carefully review all the benefit choices you made and click Submit. If you enroll any new Dependents, you can either upload the required documentation into the event on workday (in your inbox) or skip for a Dependent Eligibility Audit packet to be mailed to your home within a few weeks of your enrollment processing. The audit must be completed and returned to CoreSource for your dependent coverage to go into effect. Contact CoreSource CONNECT at 1-877-848-9997 with any questions regarding the enrollment process. Benefit changes are sent to CoreSource every Monday morning. If you have submitted a change request after the weekly update, it will transfer to CoreSource the following Monday. Contact HR Benefits at 717-544-1177, option 2, to discuss a benefit change that has not yet crossed to CoreSource.